1) This peer reviewed paper was presented at the FIG Working Week in Christchurch, New Zealand from 2-6 May 2016. The article introduces a holistic analysis for early warning, which includes all relevant processes and cascading effects, allows just in time warnings and provides reliable and robust real-time data. Early warning systems for floods and storm surges currently are based exclusively on water level fore-casts. Other loads such as wind, waves, currents or heavy rainfalls as well as the resistance of the flood protection structure itself (e. g. dikes, flood protection walls) are not considered. If they occur simultaneously, the flood protection structures may fail before the design load is reached. Therefore, it is absolutely necessary to develop a sensor- and risk based early warning system which includes all relevant processes and cascading effects, allows just in time warnings and provides reliable and robust real-time data. A geoportal visualizing all collected data and information should grant decision-makers access. Our integrated approach involves the implementation of a Sensor and Spatial Data Infrastructure (SSDI) enabling the concept of open access to all relevant data, models and simulations. For the real-time data collection at spatially distributed locations on-site, geotextiles are installed in the dike structure and mounted to sensor nodes for monitoring of deformations inside the dike. Furthermore, the nodes are equipped with environmental sensors capturing additional required data (e.g. soil temperature, humidity). By using wireless communication protocols, a highly scalable and flexible wireless geo sensor network is built up enabling large scale monitoring of sea dikes. For maximizing the information effectiveness and reducing the own efforts, additional data from existing spatial-temporal data repositories (discoverable and accessible by web services) can be coupled with the sensor data. This fusion and integration of all relevant information facilitates a holistic analysis for early warning. The use of (geo) standards ensures integration of such heterogeneous data sources and interoperability. Current missing (geospatial) standards for mandatory new functionalities will be specified and developed. This gateway to the early warning system enables access to the real-time sensor, other existing data resources as well as to methods and results of hydro engineering simulation tools. Thus, the geoportal allows user access to all information via Internet with stationary or mobile clients at any time and any place. The German Federal Ministry of Education and Research (BMBF) and the German Research Foundation (DFG) have identified the necessity to foster methods for early detection of natural risks, especially intensified by cascading effects and using innovative sensor and information technologies. One of the main hazards is the failure of coastal dikes triggered by water and wind of the North Sea. Seadikes and estuarine dikes represent the main coastal protection structures in Germany and protect low lying areas in the northern federal states (e.g. Schleswig-Holstein). More than 2,400,000 people and an area of more than 12,000 km² are protected by more than 1,200 km of sea dikes and estuarine dikes in Germany (Schüttrumpf, 2008). Although the affected landmass is not comparable to flooded landmass in other parts of the world, the density of population and economic value in Germany gives protection a high importance. For example, in the city of Hamburg the protected value by estuarine dikes is more than 10 Billions of Euro, in Schleswig-Holstein more than 47 Billions of Euro (Schüttrumpf, 2008). Taking these numbers into account, it is obvious that the safety of these structures has a tremendous relevance for all activities in coastal areas. Nowadays, early warning systems are only based on water level observations and predictions. It is well understood, that wind, waves, currents and the resistance of sea dikes towards wind and waves play also a pivotal role in dike safety. Therefore, it is required to establish an early warning system taking all parts of the chain of events within a risk based approach into account by combining different sensor and third party data, prediction models, marine data infrastructures and smart technologies. It should operate in real time, allow access to all data and results at any time and any place and has to consider international standards for data definition and exchange. 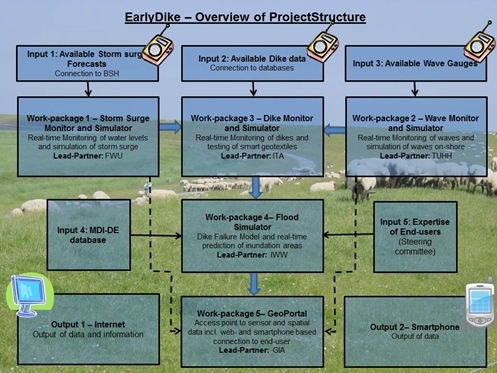 The presented project called “EarlyDike” focuses primarily on the development of techniques and modeling tools which are required for an innovative and intelligent risk- and sensor-based early warning-system for coastal and estuarine dikes. Using these developments the German authorities can fulfill their responsibility for up-to-date coastal protection. The project requires different key competences and knowledge which leads to an interdisciplinary team of research institutes working on the different packages. The “Storm Surge Monitor and Simulator” package covers the development of a statistical storm surge model by using observation and model data as a basis for a storm surge simulation. Mainly responsible for this package is the Research Institute for Water and Environment at University of Siegen (fwu) (Fig. 2). The work constitutes of water level forecasts (up to three days ahead) for the entire German North Sea coastline with a high temporal (at least 15-minute values) and, more importantly, a high spatial resolution, i.e. continuously every few kilometers along the coastal defense line will be provided. Optimized tidal predictions for the shallow German Bight, point wise water level forecasts of the Federal Maritime and Hydrographic Agency (BSH), and wind forecasts from the German Weather Service (DWD) taken into account, water level forecasts will be available for the entire German North Sea coastline. Based on observations of e.g. wind or water level and the influence and behavior of waves with a statistical wave model, a wave simulator is developed. High accuracy wave impact nowcasts and forecasts as operational systems with a temporal resolution of Δt = 1h and depending on the local geomorphological formation with a spatial resolution of up to a few 100m will be provided. The Institute of River and Coastal Engineering at Hamburg’s University of Technology (TUHH WB) is responsible leading partner of this package. In the third package the dike construction itself will be real-time-monitored by sensors for soil temperature, soil moisture and by newly developed smart “geotextiles”. Taking into account the influences of soil temperature and soil moisture, the geotextile will be able to identify stress and deformation (strain). Both, strain and moisture can be measured by the change in electrical resistance of special sensor yarns. The specification of the required configuration and spatial resolution in the measurement points is integral part of the research. This package is led by the Institut fuer Textiltechnik (ITA) and the Institute of Hydraulic Engineering and Water Resources Management (IWW) at the RWTH Aachen University. The “Flood Simulator” is implemented by IWW. It computes predictions of inundation areas in the case of an expected dike failure on the basis of the simulators of the prior packages. The resolution of the computation of the flood simulator solely depends on the geospatial data input. An early warning system for dike failures and resulting flooding events, as described in the subsections before, requires permanent monitoring of changes of the physical parameters (waves, water levels, dike) and forecast of changes and impacts. The working package, “GeoPortal, Sensor and Spatial Data Infrastructure“ deals with the integration and fusion of the geo sensor networks, simulations and other spatial data into a single service-oriented architecture (SOA). In addition, dissemination channels like a web portal will be realized. The Geodetic Institute and Chair for Computing in Civil Engineering & Geo Information Systems at the RWTH Aachen University (gia) and the Federal Waterways Engineering and Research Institute (BSW) are the responsible partners for this package. The GeoPortal is the interconnecting part for data input, exchange and output. This paper focuses mainly on the integration of data and results of the previously briefly described packages and the setup of a web-based geoportal. The EarlyDike geoportal provides access to the input data for the different simulators and models captured by in-situ sensors or received from third parties. Further, a user interface is to be implemented enabling the integration of the simulators and exploration of the corresponding results. Several institutions like the German Meteorological Service (DWD) or the Federal Maritime and Hydrographic Agency of Germany (BSH) already offer data which can be utilized to run our simulations. These datasets can be retrieved on demand via data carriers or FTP server. Although there exists already some standardized services, the main procedure of requesting this data still involves high manual efforts which also lead to issues in reliability and timeliness of data. A more sophisticated approach implies using web services to reduce manual efforts and enhance data quality. Therefore, the concept of Spatial Data Infrastructures (SDI) is to be applied. Data networks for spatial information (SDI) are currently built up worldwide improving the availability and the exchange of spatial related data (Groot 2003, Bocher & Neteler 2012, Harvey et al. 2012). Generally, a SDI provides user access to many voluminous geospatial datasets via a consistent infrastructure (Schleyer et al. 2014). SDIs are currently established in different levels by governments in the European Union (EU) member states (Craglia & Annoni 2006, Thomas 2013) and for different themes. The Germany-wide SDI „Geodateninfrastruktur Deutschland” (GDI-DE) is a network of the state of Germany, its federal members and local authorities for spatial data access. It is integrated into the EU INSPIRE infrastructure. A current state report of GDI-DE is published by the “Lenkungsgremium GDI-DE” (BKG 2013). Regarding waters and coastal protection, the publicly funded marine spatial data infrastructure Germany (MDI-DE) (Lehfeldt & Melles 2011, Rüh & Bill 2012) (fusing former NOKIS and GDI-BSH) integrates data resources for coastal engineering, marine environment, and maritime conservation from different German federal states and national agencies. Web portals are often deployed to discover, view, access, and query geo information via the Internet (Bernard et al. 2005). These so-called geoportals serve as central access points to spatial data infrastructures, e.g. the GeoPortal NRW or the portals of the Metropolregions Hamburg and Berlin. Other existing geoportals provide access to georeferenced information of different themes like energy, land use, etc. For the EarlyDike specific data and simulation results, an own SDI will be set up and a geoportal will be created to explore this data. Since the provided datasets by external SDIs are not sufficient as input data for dike simulations, the seadike itself has to be enriched by in-situ sensors capturing crucial observation values for monitoring and simulating the inner state of the dike. The sensor data should be transmitted in real-time to the database and the simulators. Additionally, the monitoring stations should be spatially spread over the whole dike to assure an area-covering monitoring. Since the utilization of innovative geo textiles is a new concept in dike monitoring, defining useful specifications for e.g. accuracy, timelines and spatial resolution is part of the research. These requirements lead to an architecture called Wireless Geo Sensor Network (WGSN). (Wireless) sensor technology has rapidly developed in the past years and became interesting for more and more disciplines. Current sensor nodes can be equipped with multiple sensors for capturing environmental parameters (e.g. air temperature, air pollution, water quality, etc.). Due to the ongoing improvements, geo sensor networks are increasingly utilized to monitor Earth’s phenomena. Examples are disaster management, environmental monitoring, public security or urban flooding (Iyengar & Brooks 2012, Akyildiz & Vuran 2010, Pengel et al. 2013). At each measuring site the needed parameters (see 2.3)have to be collected. All different kinds of sensors at one location are aggregated and mounted at a single sensor node in our network. Using data of different sources, standards for data formats and exchange are essential. Standardization initiatives aim at standardizing data structures, data exchange and also sensor definition, description and observation that enables data capturing and joining from different sources. In Europe the INSPIRE directive (INSPIRE 2007) aims to “establish an infrastructure for spatial information in Europe to support Community environmental policies, and policies or activities which may have an impact on the environment” and is a legislative act for all EU member states. Data structures defined by the INSPIRE directive and its subsequent specification documents are related to the Open Geospatial Consortium (OGC)-standards. The OGC is a worldwide consortium of companies, government agencies and universities participating in a consensus process to develop public available interface standards. The standards empower technology developers to make complex spatial information and services accessible and useful with all kinds of applications. In particular the OGC web service interface standards (e.g. Web Map Services (WMS), Web Feature Services (WFS)) (Benedict 2005) and the OGC data encoding standards (e.g. GML, O&M, WaterML) are important for the project’s objectives of data exchange and data fusion. 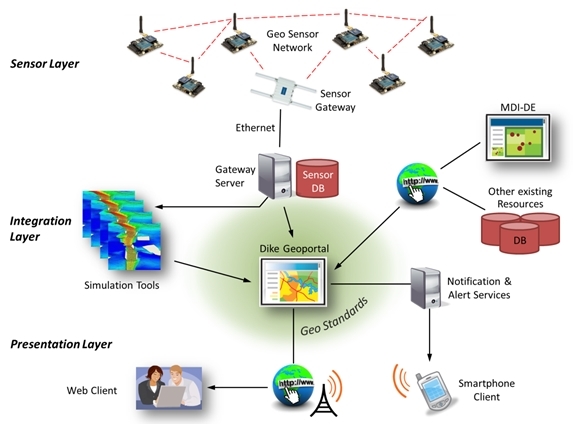 For improving the integration capacity of geo sensor resources in applications and ensuring interoperability, the OGC originated the Sensor Web Enablement Initiative (SWE) (Grothe & Kooijman 2008). SWE is occasionally used in recent projects, such as OSIRIS utilized for different use cases (e.g. air pollution monitoring) (Jirka et al. 2009), SLEWS for landslide early warning (Walter & Nash 2009) or FluGGS for river basin management (Spies & Heier 2010). 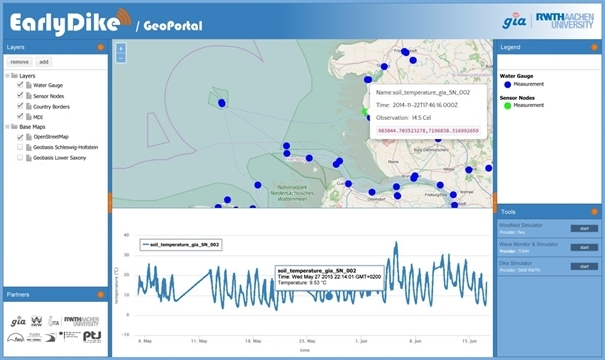 The package “Geoportal, Sensor and Spatial Data Infrastructure“ of the EarlyDike project aims at the development of a Sensor and Spatial Data Infrastructure (SSDI) for early warning (Fig. 3). It combines existing spatial-temporal data captured by means of a WGSN. The data will be used in different monitoring and simulation tools and will be provided together with the simulation results to the end-user by a geoportal. The fusion of multiple, heterogeneous data resources in an early warning system is a crucial aspect for a holistic monitoring approach. Thus, physical interfaces to the sensor data, soft-ware interfaces to the external data resources as well as to the monitoring and simulation tools have to be developed and implemented. Following the principal of SOA for distributed software systems, web services are deployed. In order to ensure interoperability, thereby international standards from geo information science defined by INSPIRE of the European Union and the OGC are adapted. Those standards will be – if necessary - extended to hydro engineering simulation tasks. As central access point to all information a dike geoportal is implemented and deployed. It also enables access from smartphone devices and introduces notification and alert services. Alert messages are created automatically as result of the automatic real-time analysis of the collected sensor data and the connected hydro engineering processing tools. Alerts may not only be given for the present but also as a forecast for future events. The definitions of the data types needed and the specification of the simulators’ requirements in regard to spatial and temporal resolution, quality and accuracy are formulated in a previous step. Existing data providers and SDIs are browsed for data supply and data accordance to the predefined requirements. There are plenty external data suppliers like the German authorities for spatial base data of landside topography and orthoimagery (e.g. Landesamt für Vermessung und Geoinformation Schleswig-Holstein), the German authority for climate data DWD or the authority for maritime data BSH. This data can already be utilized as core for monitoring and simulating. The INSPIRE-GEOPORTAL and GDI-DE are considered as useful SDIs on European respectively national level and MDI-DE as a SDI for maritime data of the German coasts. Interfaces, data formats and update rates are to be specified to connect the different hydraulic engineering simulators and the geoportal. Missing required data (e.g. dike’s soil moisture, water level, swell) have to be measured by the WGSN. The required spatial and temporal resolution of the captured data affects the number, the placement, and the configuration of the sensor nodes. 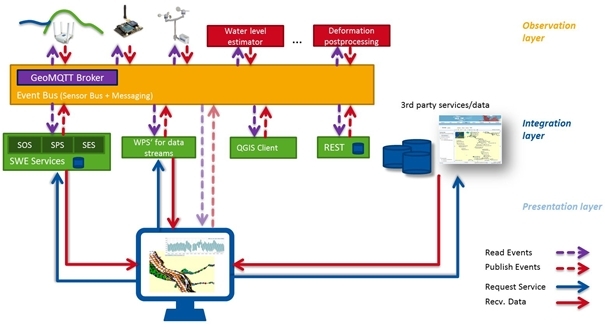 A Wireless Geo Sensor Network (WGSN) is implemented for the parameter sensing on-site. The WGSN consists basically of sensor nodes, which incorporate geotextiles and environmental monitoring sensors, communication interfaces as well as the power supply. In this project, devices with modular design are configured and equipped with different sensors. The central aspect is the design of sensor nodes for gathering and coding the measurements of geotextile sensors and supplementary environmental sensors. Therefore in the first step, the physical connection between sensors and the sensor node via standardized interfaces (I2C, SPI or RS232) and if necessary preadapted electrical circuits (e.g. geotextile ITA) are prepared. Depending on the required spatial resolution of the parameters to be sensed, the sensor nodes are equipped with one or more different sensor units. In a subsequent calibration phase besides the general test of functionality, the sensors’ characteristics (resolution, accuracy, characteristic line) are analyzed. The acquired calibration functions or look-up tables for each sensor are known and stored in the sensor nodes in order to adjust the measured data. After the calibration phase, the sensor nodes are programmed for reading data series from each single sensor regarding the required temporal resolution. By means of statistical preprocessing of the collected data series, an average value and quality measure (e.g. standard deviation) are encapsulated to data packets. For flexible deployment of the WGSN, the wireless transmission of the generated packets towards a network gateway is suggested. Therefore, the sensor nodes are linked to each other by a radio communication technology that ensures a self-organized and scalable wireless network. A suitable communication protocol for that purpose is ZigBee PRO which is based on the physical layer and media access control protocol IEEE 802.15.4. ZigBee PRO devices can transmit data over long distances and are able to build a wireless ad hoc network following a mesh topology. Data packets are forwarded hop-by-hop according to the routing entries from the intermediate sensor nodes which act as router in order to reach the network gateway. The network gateway also acts as a data sink collecting the packets of all nodes and afterwards transmitting the gathered information to the integration layer in our architecture. Based on the ZigBee PRO protocol we use the lately quite popular Internet of Things (IoT) protocol Message and Query Telemetry Transport for sensor networks (MQTT-SN) which is especially useful for Machine-to-Machine communication. An MQTT-SN message (like a normal MQTT message) consists of a topic and a payload, so that e.g. a sensor node can publish a message with the topic “soil temperature” and the payload that consists of the measured temperature value “4.9 °C”. The advantage of applying this protocol is that each sensor node can also receive messages from the network. More precisely, we are using an own extension of the MQTT protocol, the so-called GeoMQTT protocol. This extension introduces some additional features compared to the original protocol and is fully compliant with existing MQTT software. Briefly, a GeoMQTT client adds a timestamp and a geographic position to every message. The final protocol stack of our sensor nodes is shown in Figure 4. Adjustment of the transmission power in the WSN depending on the radio range between the nodes and channel conditions. Application of power safe control mechanisms which allow the nodes to go from active mode to sleep mode after transmission. Due to the expected low sensing rates (< 1 sample/min) the nodes can sleep most of the time resulting in long battery life. Utilization of solar panels for recharging the batteries in case of outdoor application. The integration layer in our proposed architecture merges all the data from different sources. Therefore we adapt the idea of a sensor bus (Broering et al. 2010) whereby all the measured data is temporarily collected in a central component. This bus is basically the second component of the MQTT protocol which is the so-called message broker. The broker receives messages from the clients with a specific topic and disseminates the messages to all clients which are subscribed to the corresponding topics. This way, applications can simply hook in the bus and receive all new messages published on a specific topic. The sensor nodes described in the previous section are directly connected to the broker and are also able to publish and receive messages. Like mentioned before, we are using an extension of the original protocol and therefore, we have implemented a GeoMQTT Broker. This architectural component is shown in Fig. 5. However, we try to push the idea of sensor bus even further into a so-called event bus. This newly introduced concept serve not only as a bus for sensor data but also for other data like processed sensor data. Processes can directly hook into the bus waiting for sensor data to arrive, process this data and republish the results to the same bus. For accessing the captured data the OGC’s SWE standards will be deployed. For interoperable data management, the OGC standard Sensor Observation Service (SOS) is used. SOS itself requires SensorML and O&M standards. The Sensor Model Language (SensorML) is used to describe the sensor itself whilst the ISO/OGC Observations and Measurements (O&M) is aimed for data modelling and encoding. The standard SOS is also part of a proposal for the INSPIRE maintenance and implementation process for download services. The data captured by the installed WGSN is stored in a spatial (geo) database. A feeder application hooks into the previously described sensor bus and inserts the arriving data tuples into the database. For the EarlyDike-project the SOS open source implementation of 52°North GmbH is to be used. The underlying Geospatial DBMS PostGIS is a spatial database extension for PostgreSQL object-relational database. It adds support for geographic objects allowing location queries to be run in SQL. All used applications are free software according to the GNU General Public License (GNU GPL). The presentation layer is realized as central web-based information access point called “Dike GeoPortal”. In general, the portal serves for the presentation of data and invocation of geoprocesses using WMS, WFS and Web Processing Services (WPS) (Fig. 6). Therefore, the free mapserver “Geoserver” is deployed providing WMS and WFS of own data stored in the geo database mentioned above. The geoportal is set up using the also free software libraries (e.g. OpenLayers or GeoExt). Base maps (topography, orthoimages on the landside, bathymetry on the seaside) will be received using WMS from data providers like the national authorities of the federals states for spatial base information respectively hydrological data. Further data, for example sea level and climate/weather will be collected by WFS from the responsible state institution like BSH respectively DWD. If necessary or more practical, we will also use SDIs like MDI-DE. Semantic information is presented in spatially referenced thematic maps overlayed by dynamic icons on top of the selected base map, Data windows will pop up if the icons are selected. Time-periods like water levels and gauges or temperature are visualized by dynamic tables and/or graphs. Data, measured by the installed WGSN and stored in the mentioned SOS-database, are accessed for presentation in the geoportal by the SOS requests like “GetObservation” or “GetResult”. Thus the pure sensor data can be queried or specific requests e.g. for the last observed value or a graph of the values of a time-period can be performed. Simulation results are accessible via WMS, WFS or as a result of WPS. For maximizing information efficiency, all connected data (own sensor data, external data and simulation results) are presented together in one coherent and spatially referenced matter. Thus, the web portal delivers descriptions (metadata), provides access, and enables the map-based visualization of all spatially referenced information. Besides the current situation, the state in the past can be observed by e.g. time series to analyze even sudden changes over time. In addition, we will utilize adaptive software components (like OpenLayer mobile) to render the dike portal not only for desktop browser but also for mobile phones (e.g. smartphones). By developing mobile web forms, users are able to obtain an overview of all sensor values at a glance, e.g. in case of incoming alert notification. It is also conceivable to create profiles for addressing different user groups, e.g. granting access to selected content for public users or providing access to all data for expert users. The development of an SSDI is an essential part of an early warning system for floods and storm surges and enables the integration of all relevant data in a fully digital workflow including data capturing on-site, embedding external data sources as well as the inclusion of hydro engineering simulation tools. This leads to a completely novel approach for a holistic dike monitoring as a general basis for early warning systems. The outcome of the work packages will increase knowledge in geo information science since it directly affects future developments in geospatial standardization towards spatial modeling and spatial data integration, especially concerning water and hydraulic engineering. The complete warning system will protect against uncontrolled flooding of wide areas. In the worst case of unavoidable dike failure, it will give early alert and inundation prediction. It will be implemented first on a test dike at the German coast of the North Sea. In case of a successful evaluation designated users are the German authorities for coastal protection in Schleswig-Holstein (LKN Husum) and in Lower Saxony (NLWKN Norden). They are corresponding partners in this project. Other dikes around the whole world may benefit from such an early warning system for saving lives and economic values. The EarlyDike project (http://www.earlydike.de/) is funded by the German Federal Ministry of Education and Research (BMBF) within the GEOTECHNOLOGIEN programme (03G0847A). Benedict, K. (2005): The Open Geospatial Consortium Web Map, Web Feature and Web Coverage Service Standards – an Overview. ESIP Federation Meeting, Mexico. Bernard, L.; Kanellopoulos, I.; Annoni, A. (2005): The European geoportal – one step towards the establishment of a European Spatial Data Infrastructure. Computers, environment and urban systems, 29(1). Bocher, E., Neteler, M. (2012): Geospatial Free and Open Source Software in the 21st Century, Dordrecht. Broering, A., Foerster, T., Jirka, S., Priess, C. (2010): Sensor Bus: An Intermediary Layer for Linking Geosensors and the Sensor Web. In: Proceedings of the 1st International Conference on Computing for Geospatial Research and Application, COM.Geo’10, 21-23 June, Bethesda, MD, USA; ACM: New York. pp. 1-8. Craglia, M.; Annoni, A. (2006): INSPIRE: an innovative approach to the development of spatial data infrastruc-tures in Europe. In: Proc. of GSDI World Conference, Santiago, Chile. BKG (2013): Federal Agency for Cartography and Geodesy: Ad hoc reporting by INSPIRE AG to the GDI-DE Steering Committee (LG GDI-DE): INSPIRE Infrastructure for Spatial Information in Europe. Member State Report: Germany. INSPIRE (2007): Directive 2007/2/EC of the European Parliament and of the Council of 14 March 2007 establishing an Infrastructure for Spatial Information in the European Community (INSPIRE), http://eur-lex.europa.eu/LexUriServ/LexUriServ.do?uri=CELEX:32007L0002:EN:NOT. Iyengar, S. S.; Brooks, R. R. (2012): Distributed Sensor Networks. CRC Press: Boca Raton, USA. Jirka, A; Bröring, A.; Stasch, C. (2009): Applying OGC Sensor Web Enablement to Risk Monitoring and Disaster Management. In: Proc. of GSDI 11 World Conference, Rotterdam, Netherlands. Thomas Lüllwitz (Hg. ): Geoinformationen für die Küstenzone. Norden Halmstad: Points Verlag (3), S. 107–116. Pengel, B. et al. (2013): Flood Early Warning System: Sensors and Internet. In: IAHS Red Book N 357, Floods: From Risk to Opportunity. IAHS Publ. 357. Schüttrumpf, H. (2008): Aktuelle Entwicklungen im internationalen Küsteningenieurwesen - International Conference on Coastal Engineering. In: Korrespondenz Wasserwirtschaft : KW. - Hennef : GFA. - ISSN: 1616-430X, 1865-9926. - 1 (2008) 12, S./Art. : 664-665. Walter, K., Nash, E. (2009): Coupling Wireless Sensor Networks and the Sensor Observation Service – Bridging the Interoperability Gap. In: Proc. of 12th AGILE International Conference on Geographic Information Science, Hannover, Germany.